Monday at Fairbanks Ranch Country Club, Operation Game On was raising funds one swing at a time with its most important annual fundraiser, the 15-Inch Cup Challenge. Since forming 5 years ago, Operation Game On has helped over 500 active and retired military members. 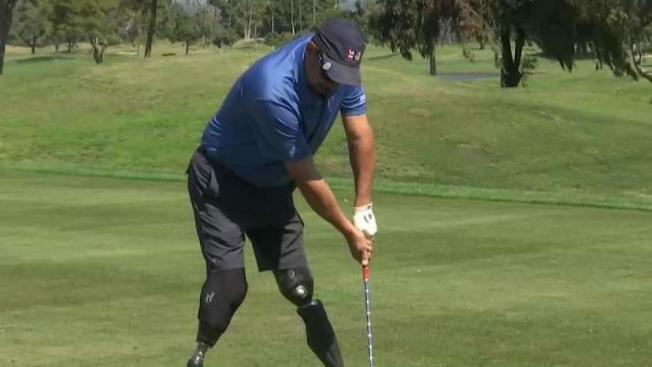 The goal is to help combat injured troops regain their lives through golf. Each participant receives new clubs from TaylorMade, free lessons, golf clothes and access to golf courses. Combat injured troops often return home with life-altering injuries and many with PTSD. Operation Game On focuses on introducing these military members to the game of golf. The hope is that golf provides mental and physical rehabilitation which rapidly allows these troops to regain confidence, allowing them to enjoy an active and healthy lifestyle again. San Diego resident and longtime Torrey Pines Golf Course starter Tony Perez is the founder of Operation Game On. Tony is also the father of PGA Tour pro Pat Perez. Military personnel who’ve been aided by Operation Game On call Tony Perez “a hero.” Many going so far to say he’s saved their life. “I get calls from parents, grandparents, wives, mothers, saying 'You know, you really saved my son or daughter's life,' and that’s pretty strong,” says Perez. One reason messages like that hit Perez strong is because returning from war to civilian life is something that he knows all too well. Many of the soldiers are dealing with PTSD, amputations or other serious combat injuries. It’s hard to believe a little golf can help them, but it does.